Happy New Years! I was sound asleep by 9! David asked me, "Mom, are you going to stay up till Midnight?" I said I thought so, or that I would try. He asked, "What are you going to do, to try and stay up?" I told him, "I don't know, lie in bed!?!" ZZZZ... I was out in no time! I have decided that I suffer from Bi Snowlar disease. It is going to snow! It is snowing!! Right now! The weather man says yes! Now she says above 500 feet! Well, I picked the winner of the Tim Marshall contest. Unfortunately, Tim has re injured an old injury and the doctor has told him to stay off the sticks. He has promised to do the trip, but at a later date, when the doctor has approved him for fishing again. Get well, Tim! Get well! I sincerely don't know what is going on, but for some reason I can't see very well. I mean, worse than usual. It's so frustrating! Everything is blurry. What is interesting, is that it has been heavy on my mind, as to whether I should seek a surgeon to do surgery on my eye, and whether to stay here locally, or fly back East, where they have experience with eyes such as mine. My doctor, Dr. Robertson, is no longer doing surgery at Casey Eye Institute, so there goes that option. Not only that, but when I asked him if he'd do the surgery, he said, "Jennie, not only do I not want to do surgery on you, I loathe the idea!" I think he was pretty clear, don't you? He told me when he did do surgery on me, my eye literally fell apart in his hands. Yip, that would cause me to pause, also. So, I find myself with no eye doctor. I haven't had my pressure checked in ages, and I think I'd better start shopping for a doc. Sometimes, with marfan, you just tend to let things go, unless something happens. Well, something is happening. I first noticed it a couple days ago, when trying to tie a knot. I sat there in the cold and snow, studying the eye(s) of the hook. There were five of them! Which one do I thread? Usually it's slightly frustrating, but never 5 eyes of hooks! Geesh! That's alot of eyes! I wonder how many hook points I was fishing with? The same? It can't be all bad, though... You know, when I catch a fish, I catch five, too! You can limit out really quickly, that way! I also have double rods, reels and rivers. Life is grand, right? So, as I sit here squinting at the page to try and read it, I am convinced. Tomorrow starts the hunt for a new doctor who likes a challenge. One that will say, "Jennie, not only do I want to do surgery on you, I LOVE the idea!" No, wait-- that would scare me! Anyway, HHaappppyyy NNeeww YYeeaarrss to all-- May this year hurry up and bring duplicate springers, (without duplicate fins) to your net! I've been doing maintenance, essentially since 8:00. I didn't expect it to take this long, but it is now 1:55 and I am still not done. It's a lot of waiting while the server processes. I've also cleaned out the last two months of picture uploads. Hope I didn't erase one you needed! Anyway, ETA is about 3 for the BB. Prolly sooner. If I don't quit being bi snowlar, I may really become seriously snow sick-ill! I haven't slept solid due to the teasing possibility of coastal snow, for nights on end! I fall asleep with the porch light on, gazing outside to catch a glimpse of an errant snowflake. The TV is on, but I'm not watching. I doze off, staring into the night sky. Two hours later, Molly the cat is sleeping on my face and it smothers me awake. Up with a start, I run to the window with the spotlight. Checking for deer and elk, I tease myself. That's what I'm doing, as I search the meadow and likewise, examine the precipitation falling from the sky. No deer. No elk. But I could swear that those rain drops are too thick. Three AM rolls around, and Kilchis has me twisted up with one leg on the floor. Oh! I'm cold! It must be snowing! Up I go, again, and dash to the window. I'd better check to see if I left it open. While I'm there, I'll just check the weather, you know. Man. Those rain drops... are they snow? I stare up at them, until sleep begins to greet me, again. I slog back to bed with rain drops still on my nose and cheek. I order the dogs and cats away. I need some sleep, animals! I think they can sense my unsettled patterns. At 5:30, both cat and dog are back in their downy places, curled up where they don't have my graces. It wakes me, again. It's time! I can get up for good! 5:30 is fairly sane, isn't it? I dash to the window, trying to act casual and adult like. I flip on the deck light. YES! SNOW! I KNEW IT! I knew that the rain was too thick at three! I can hear the boys groan as they stir. Mom is so noisy, you know? This morning the ground is all snowy white. I know that the forecast is for warming, but I can handle that. I know it's going to melt, but I'm OK with that. You know why? Look at the forecast! Snow, snow, snow! It's perfect! I have to drive Andrew across Neakahnie Mountain today, and to the doctor. Perfect timing! It will be a nice drive! It's supposed to warm to 41 today. Then, home for the sleepless wait until it arrives! And when it does, it's going to stay! And when it stays, I can sleep all night, knowing that the temperatures will be frozen enough to keep it that way! That means I will get a long winter's nap, uninter-snow rupted! Long days, fishing in the snow, sledding down the driveway, and making snow angels. Hot chocolate at the ready! It's supposed to be 17 on Tuesday? WOW! Another thing that Bill mentioned that I thought funny. He said, "With the passes so bad, the Wilson will be lightly fished." Hmmmm. We'll be there! Anyone else really tired, today? I sure am! I'll never forget. When I was a young adult, living on my own, my Mom used to call me all excited when it snowed. She loved it so much! I miss that, and I still grab the phone to do the same, at times like these. Today, I will find an eye doctor. I am having increasing problems with my vision. Today is the day for phone calls. I'm learning to type by Braille, so if I make spelling errors and don't catch them, forgive me! We had a great Christmas vacation with all the nice snow on the ground. However, people are hinting towards the fact that since I, Jennie, prayed for snow, I must be responsible also, for the following threat of flooding. This is simply not so. I would never pray for a flood! Geemany! How much power do you think I have? Just because, on ifish, I wrote a prayer that several hundred people read, does not mean they prayed it, too! I simply requested a slight dusting of snow! Next time I post a prayer request, I will put a warning on top of it. WARNING: This post includes a prayer for snow. If you do not want snow, please do not proceed. There! That will take care of it! My kids believe I have absolutely NO power, as the last three days I have been glaring at weather reports, and telling them, each night, that there would be no school, and that there would be a lot of snow. We have only 1/2 inch left on the ground, and although it is pretty, we have not had enough to go sledding, even once! It is Monday, and there is no sign of our school closure on the TV or the internet. Mom shouldn't listen to the weather forecasts. Mom should listen to her prayers and have faith in them. Frankly, I haven't prayed for more snow, since we got our first batch. That should tell me something. So now, as I sit here shivering, while the fire starts to warm the house, I would like to pray for sunny and 60, but I don't dare. That would bring a flood, for sure. So, I'm just keeping my prayers away from the weather situation, and leaving that up to God. I've caused enough trouble, already! Alright, onto web work, and maybe a little fishing. Hope you have a wonderful day, and please, stay warm! I just feel heartbroken. I knew! Somehow I just knew I'd wake up to freezing rain, or slush, or mush. Well, I didn't. I was delighted to wake up, at 5:00 AM to falling snow and 28 degrees! However, now it is 6:27, and 30, and freezing rain. :( I didn't get to sled, once! By the time it is light, I'll bet it will all be melting. Well, at least there is no school for the kids. They are happy about that, for sure! I hope we don't lose power, though. Freezing rain can sure be nasty. The forecast for the Wilson is a bit intimidating. Surfing by 9:00 AM! Yikes! So, fishing is out, sledding is out, what to do? Guess I'll do what I procrastinated, yesterday. I'll call the eye doctor! I have put away everything about Christmas except for one thing that I am struggling with. I have a 2 foot Christmas tree with fiber optic lights. I can stare at it for hours, and I can't put it away! The box is out next to it, but it just stays and stays. I'm happy with that. Maybe in the spring, it will go! I heard rumors today that you're secretly building an ark out there in the timber near the Kilchis River. My informant said you had received information the water would soon get high enough to float the ark on down to the Pacific. My informant was uncertain as to the exact source of your information. Your recent Internet activities reveal you've been spending a lot of time lately discussing weather with higher powers. Is there any truth to these reports? My sources tell me you've even contacted area veterinarians with regard to mates for a dog and cat that were among the first animals to be placed on board the boat you're building. It's particularly disturbing to me because I'm certain you'll recall my recent pleas that you refrain from seeking the help of the Almighty in blanketing the entire region with snow and ice. I'm totally ware of your success in this regard. Are you secretly doing the same thing where rain and melting snow are concerned? An early reply would be appreciated. In event it's not forthcoming, I plan to report your recent activities to the proper authorities. After intense research, I found it to be from my friendly bass master, Stan Fagerstrom! STAN! I've been fishing the low, clear waters of the Kilchis with 4 to 6 pound test. It's SO low! Bill and I wanted to drive up to the park to sneak up on a couple steelhead and fish. We took two cars, as we both wanted to take our dogs. I went first. I rounded the corner where there is a steep hill down into the park. On the right is a sheer cliff to the river, maybe 300 feet down. The road was caked with ice! Never in my life had my heart pounded SO hard! At the entrance to the park, I got out of my car and told Bill. "I am going home!" I do not like ice and I have a real thing about cliffs that go down to fast moving, cold water! I turned around my rig, and crept up that hill, with my tires clinging the gravel edge for traction. Finally back at home, I kissed the ground as Bill laughed, turned around, and went back to the park to fish. I fished out back, and did just as well! Plus-- I'm still alive! It's nice to walk the banks of the Kilchis lately. The snow between the rocks makes an even walking surface, which is such a relief to me! Only thing is... I have learned not to wear felts! Somehow, they collect snow and ice! As I walk, you find myself getting taller, and taller, and taller! Walking on snow stilts is very difficult! With the snow on the banks, and the dark cloudy skies, the river looks different, and more beautiful than ever before. The river is an intense deep green in contrast to the snowy white ground. It's almost as if the world has changed to a jagged black and white checkerboard. Even though it is low and clear, it seems a perfect hiding place for the steelhead that reside there. I think that Tillamook Public Schools are the only school in Oregon to be open, today. My kids are not pleased with this fact. I, however, after nearly three weeks of constant company, welcome the arrival of the school bus. I think today is the day that I will call that eye doctor. Please stay warm. I realize that many of you are embedded in ice. I pray that your electrical power stay working, your family stays warm and comfortable, and that you don't need to travel, today. I think perhaps, it's important that I don't pray for snow, anytime soon. I think I'm nearly ready to go stir crazy! I went through a period last week, or was it the week before? I was wondering if I was growing tired of fishing. I lamented, as I lazily shuffled through fishing gear, trying to set it in some semblance of order. Trout here, springer here, too many lures, too many lines! I shrugged, and let the tackle remain scattered. As I headed back into the house, it nearly froze me up with fear and worry. Am I tired of fishing and all that goes with it? If I get tired of fishing, how could I run ifish.net? Could it really ever happen? You know what? I'm definitely not! I have been feeling (like I'm sure you all have been,) the most serious case of cabin fever, and the most intense craving for spring chinook! I want OUT OF HERE and onto the river! The state of Oregon is finally thawing out. This leaves us with the prospect of high water--whether on the coast, or on the big rivers, it's not going to be ideal. But, I feel that feeling. That feeling of wanting to feel my rod bend, and my reel sing! It's totally clear, and officially undeniable. I'm still an ifish addict! This is good news! I have visions of giggling, while being jerked out of the boat seat by a strong, sure, flipping, leaping mass of springer! I just need to fish! I'm not tired of fishing, I just have been cooped up, and lost the feeling! When Oregon freezes, a blizzard of controversy snows down and blankets the board. Posts spit out of the frozen sky, sounding negative and bitter. When that happens, it starts to stick, and build. We are going to melt that ice today, with the rising temperatures, and the renewed hope of a warm day, and some sunshine! I can see spots of green lawn through the snow, already! That signals hope to me! You know, when you spread love and kindness, it's catching, too. I prefer that, don't you? Oh, much! Let's spread some love to our fishing brothers and sisters out there! Let's start fishing again, soon, everyone! Let's get out! We are thawing in time for the meeting, today, in Salem. I certainly hope you plan on attending. We need you all! I'm not sure what I'm going to do. I'm a bit afraid, still, of the coastal passes. Maybe I'll try to go through that tackle again, with a renewed sense of hope and a dream of spring chinook, in mind. After all, my freezer is showing a deficit of those tasty vac packed delicacies, and I want not only to see a fresh one on the bbq, but enough to stash, and get me through these winter blues. I live for spring chinook! Off to talk to Bill about the meeting in Salem. Are we going? He's excited about the goose hunt tomorrow, but is curious as to where it will be held. That's the first order of the day. Where are we hunting? Off I go, have a great day, and do know, do not forget-- do not lose the feel!... 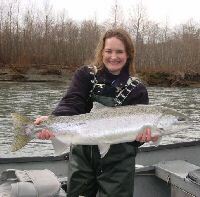 spring chinook is coming to a boat near you! I just went for a walk along the river with Kilchis. It has receded some, and I just love these walks! I found a Thill bobber, a beautiful pink pearl bobber, two Spin and Glos, and an agate to die for! The word for today, is "bejumbled." That's how I feel. I have a bazillion projects on my plate. I simply can't do them all, so... I am simply going to go fishing. They will all disappear while I'm gone, right? Thanks to Eric Linde, for the gracious donation to ifishers for a sturgeon trip for four! Thanks, also, to Konezone Flashers, who have given us an ifishback buck for a dollar off of the Flashers, at the sporting shows! Thanks! OK, off I go to the river... Wonder what hides there for me, today? Could be a fish, could be some angler's lost tackle from the high water, could be an agate.. Whatever it is, though, the river brings me peace, quiet, and the magic to come back and get this work done! Toot toot! Off to row, row, row the boat gently down the North Fork, Wilson, Trask or Kilchis! Haven't decided yet, but today is my day! The object of life lately, is to see how I can rearrange ifish to fit just one more banner on the page. I don't know how many times I have said, "Sorry, we aren't accepting any more advertisers on ifish." Much appreciative welcome goes to Luhr Jensen! Luhr Jensen has always been good to ifish. How could I pass them up? How could I pass up a custom painted limited edition Kwikfish? You got it. We just can't. So, I rearranged, and refitted, and redesigned, and presto! There is Luhr Jensen! Front and center! Please take a moment, and help us decide on what color we want, here! Web design is so interesting sometimes. The use of space is so misleading. I've always been a believer in lots of white space on web sites. I love the clean look. Well, I haven't exactly achieved that on ifish, but by moving things around, after staring, for hours, all of the sudden it comes together. Aha! Right there you go! Anyway, off I go. I feel like I accomplished something. Now, let's see if I can accomplish something on the river! If nothing else, I can use the aesthetic and soothing qualities that only a trip down the river can bring me. I'm ready! Warming! Keep your pink and white jigs out of the water! They are dangerous for chinook! Darnit!! 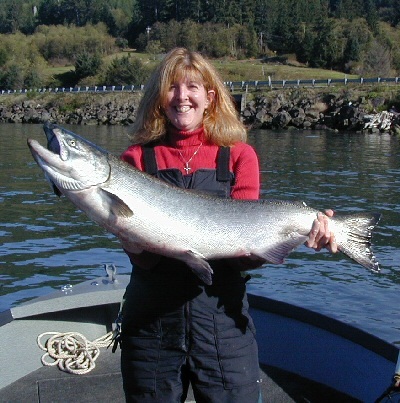 I am SO tired of releasing chinook! I am so tired of tossing my jig out into the water, only to see it disappear, and suddenly feel that heavy burrowing head shake of a chinook! Bill kept saying, "Jennie, that is one BIG steelhead!" I said, "No, Bill, it's a chinook. It's just shaking her head back and fourth, and won't budge off the bottom!" "Steelhead" He said, much later. Sure enough, a 20 pound or more bright, chrome and shiny chinook hen was released from my pink and white First Cast Jig and swam off into the Wilson river. Now. May I please catch a steelhead? No. I hooked one later, on a pink glitter clown, but it got fouled in someone's anchor rope and that wonderful solid pull turned into slack line. Dead mono flew in the wind, past my face, and horizontal to the water, like a flag, at half mast. I don't know how many chinook I have landed on jigs this year, but if you please, I have had my fill! I want LITTLE fish now. Little, bright, chrome steelhead that dance with their tails on the top of the water, cart wheeling into space, and sending giggles down my spine. Hey, I'll even take a BIG steelhead! But, chinook? Hey! It's fun, and I hate to complain, but, but, but... I want a steelie! All kidding aside, I had a great morning, and fishing, however lousy the weather, is always a needed break from my work, here. It poured sideways, and the Wilson river wind hit the side of our drift boat, and sent us down river faster than we would have preferred. The trees, hovering above us, roared in the wind. That's a haunting sound, you know? The water was high, but a beautiful steelhead green. We needed a fair chunk of lead to keep our rig to the bottom. Finally, Bill said he couldn't feel his spool thumb anymore, and that is when we decided to call it a day. We came home with one nice, bright hatchery buck for the dinner table. Life is good. Don't get me wrong. I love God with all my heart. However, he knows me all too well. I really feel that God knows that I have a soft heart, and that any lost or stray animal would do well at Jennie's house on the Kilchis river. Thus, a white pickup came down the driveway at about dinner time, last night. A very kind young gentleman climbed out of the car, and came up the front steps. I went to greet him. In the back of his truck, was a beautiful, but dirty and shivering springer spaniel. He had found him way up the Kilchis river logging road, and picked him up. He had a red collar, and this young man had been searching for his home. He couldn't keep him himself, and didn't know what to do. Well, of course, bring him to Jennie! It didn't matter that dinner was done, and my turkey was overcooked. It didn't matter that my kids needed attention, and just at that very moment, some less than admirable character was causing fits on the discussion board. What mattered was a poor, lonely, and afraid dog needed my immediate attention. I made several phone calls. I called the local humane society, which consists of a local vet who cannot keep dogs longer than three days, and currently can not take any at all, due to a case of parvo virus. I called the neighbors. I had Bill help this gentleman go knock on doors, in search of owners. We made a sign, and Bill and I drove to the logging bridge and put it up, in hopes that someone in search would see it. We drove around in the black of night, looking for a car that seemed to be searching. All to no avail. The white truck came back down the driveway, put the lost dog in my garage, and went on his merry and carefree way. I wanted to be in that pickup. I wanted to leave what now was a disaster of a turkey dinner. I wanted to run away from my kids that were hungry and needed homework help. Don't you just love responsibility? Don't get me wrong. I'd love to keep this handsome old dog with teeth ground down to a nub, and cataracts in both eyes. He's a lover. He's beautiful, and he's obviously pedigreed. He smells of a fresh bath, and the look in his eyes shows that he's been loved and adored. I told Bill this white springer with one large liver spot on his left side, couldn't possibly sleep in the garage last night. It's cold and lonely in there. Frankly, the only reason "newdog" wasn't on the couch with me, or under my bed covers, is that Bill's dog, Dee Dee, does not take kindly to new animals. Thus, "newdog" slept in David's room on a blanket and pillow of David's choosing. Of course, David's very best. "Newdog" will be going to the vet this morning, to have a scan performed for radio tags, or whatever those things are. If "Newdog" does not have any, I will either drive "Newdog" to the Portland humane society for adoption, or find a home for him on ifish. If you are interested in "Newdog," send me an e mail. He is beautiful, and kind, and calm. He would make someone an excellent companion. He does not mess the house, and simply looks at you, longingly, for a love, a pat, and a smile. He is gentle, and sweet. I love "Newdog" and wish I could keep him. But most of all, I would love to see "Newdog" find his owner, and have a joyous reunion. As I lay down for a fitful sleep, I thanked God for the pleasure and honor of this responsibility, and I prayed that "Newdog's" owner would find us, today. In search of information on how old this dog was, I found this poem, and started my day off, with a tear. I just walked in to wake up Andrew for school. Newdog was nestled on his bed, with his head laying on Andrew's neck. I fed Phoebe, (his sugar glider) a breakfast treat worm. I asked Andrew, "How was Newdog?" Andrew sleepily turned, put his arm around Newdog, and said, "Wonderful!" Indeed, he is. Here is Newdog's story, and pictures. I've been invited to fish with Nick Amato today, and I said I'd go, despite the fact that I have a "worry list" 2 miles long. I keep a notepad and a pen beside my bed, so that I can sleep. Sometimes, as I lay my head down, things that I need to do run to my head, race around, and keep me from sleep. I just lean over, jot it down, and let it go. Last night, this happened 16 times! I'm thinking of installing a paper towel rack. That way I can just keep an endless scroll. Sometimes I dream of shutting down registration on ifish, so that we do not accept new members. Then, I would post a post that says, "Let's get to know one another again." We'd take a year off from new members, and try to learn all 7000 registered members. I'm not going to, but it sounds good to me, at times! Also, I love the thought of no new sponsors. I have this nagging ideal that bothers me. I like to do a wonderful job with my sponsors. I like them to be hilariously happy with what Ifish does for them. I can only do that, if I know them personally, and can attest for them. Sure, it's easy enough to take someone's money, and take 5 minutes to put their link on the front page, and fogettaboutit! But, to me, it's more than that. It's trying their product, and believing in it, with all my fishing heart. With that said, it convinces me all the more that this may very well be my New Year's Resolution. No new sponsors, and get to know my old ones even better. There is a limit to the work that I can perform, and it's less than most people's limits. I don't want to be so busy with both worry and work, that I spend my nights sleeplessly jotting notes, and my days, away from the river, or my beloved family. My brother was saying to me, "Jennie, do you realize the business possibilities, with ifish?" I told him, "Yes, David, but I have limits. How many businesses, turn away perspective sponsors? Ifish does!" He shook his head, and laughed. I think he understands. I have talked with marketing folks, with big dreams and stories of me doing nothing but fishing in exotic locations, and writing my column from some hotel on the beach, somewhere. Kind of the "I'm going to make you a star, baby..." approach. They asked me how much I charged my sponsors, and upon reply, they kept repeating with rolling eyes, "Jennie, get a clue!" I have a clue. My biggest clue, is that I want to fish, and sleep, and live with my family!! I like writing my column from the canyon on the Kilchis river! Life is short, and I'm not! I'm glad Nick asked me to go fishing. I think I need to get away. Don't you? That was some fun fishing! The rain was rather wet, but we got into some nice fish. I love watching steelhead cartwheel out of the water. What a blast! Hey, lookie here! Anyone ready for Springers? Dang, I just get in the groove of one species, and it's on to the next. Oregon is awesome! Who could ever dream of better fishing? 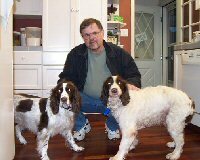 Every time I think of springers, now, I think of the Tillamook Springer that I got, above, that nearly jerked me out of my seat, and into the river. I love it when they hit like that! I wonder who will get the first springer? First off, I was amazed by the relief I felt by putting this up. I simply need a break from new sponsors, and I can now devote my time and energy to helping my regular sponsors. I like that. My plate is full. It is, too! I think I felt this true happiness feeling, or true calm, or at least, the light of day-- for the first time in ages, after I did that! I kid you not! Second, Newdog has a new home. Even though I cried after he left, I know that it is best. I am happy with the new owners, and even though Newdog was hesitant, and a little worried, I know that a permanent, good home is best for him. Kilchis was starting to get jealous and my oldest cat, Jack, was so mad that he hasn't been in the house for two days. I still reach for Newdog, and crave the loving look in his eyes, but I will get over it. Won't I? That isn't the best part, though. You know what? I tend to think the most of people who love and care for animals. I tend to judge people's value to this world, on how much they care for animals. People who love animals are good people. Rich, poor, fat, or skinny--period! I know that's weird, but it is how I feel. All of the sudden, it occurred to me. I am one of those people! Really alot!!! It feels good to be good. So, for being good, I am now going to go fishing. Come on, Kilch! Let's go! Yesterday, it occurred to me how well I like to read water. I can't wait to get down to a new stretch, scan over the colors of the water, looking for rock ledges, deeper colored waters, and the perfect current for my bobber and jig. The minute I see a stretch of new water, my eyes start furiously searching. Yes, this is why I do rotten at golf. I study the water hazards, and forget what I can't figure out why I have a club in my hand. If I am with someone, I start feeling a little panicky. I want that water first! When I fish with Bill, I never have to worry. He's the sort who goes down the trail, sets down his bag, fools with his gear, and fishes seemingly wherever! I can't do that. I have to be ready for my first cast, way back at the truck. Pocket full of gear extras, pliers, shrimp, and nothing else. No cumbersome bag or box. If the prime fishing water is indeed right at the bottom of the trail, and I see Bill park his gear there, I'm off to search for the special place. Fishing can't be that easy, you know. There is a hot spot, somewhere else, that holds an easy bite. From my experience, it's never in front of you. It's always over that log, across that deep pool, and only accessible by perching awkwardly on that high rock that has trees hanging down, making for an impossible, but rewarding first cast. For instance, yesterday Bill and I approached a familiar stretch. He was busy mumbling and fumbling with gear on first approach. I scanned the water quickly, and knew. 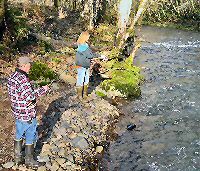 The holding water was clear across the broad stretch of water, which meant a long cast. Of course, there were branches over the water, and the chances of me tangling with them were high. OK, ready, set? Long cast, with a low landing.... YES! Perfect, I did it! Now, mend, mend, BOBBER DOWN! "Bill! Fish on!" This was in the Kilchis, right at home, but upriver a piece. I landed a native hen steelie, surprisingly colored for this time of year. She still had lots of cartwheels in her, though! Fun! After we thoroughly fished the Kilchis, we hopped in the car, and headed for the Trask. I saw lots of ifish stickers on trucks, on the way up. I thought to myself, "Five years ago, who would have thought that people would have stickers on the car, from my web site?" Odd! It made me smile, though! We stopped at pullouts all along the way, and I was able to play the "read the water" game, all day long. I had a fantastic time, until the last encounter, which is linked above. I still want to go to the pet store and buy a salamander. It's only fair, and I can be a mean school boy, too. Bill is off duck hunting, and it's pouring down rain. Good day to go fishing for a bit, when the light comes up, and then go to church. I have to repent of my evil plans for snakes, salamanders and other creatures that will go into Bill's tackle box. Where is the time flying? It's nearly the end of January, and the days are growing longer! It almost whispered spring to me one day, along the river. When it's sunny in the coastal towns, I grab for my sun glasses while driving. I retire them as I grow closer to home. The sun falls behind the trees. We live in a canyon where the sun hasn't hit our meadow in months. I'm getting closer and closer to home, every day, before putting them away! Could it be almost Spring? It seems winter has hardly brushed my doorstep! I've been cooking a lot, lately. From broccoli quiche to a tall, three layer, chocolate cake! I made the quiche four days ago. Two of them. One partial, still sits on the bottom shelf of the fridge, randomly nibbled at. That, along with left over roast beef, part of a turkey, and some assorted vegetable dishes. Granted, we are all growing a bit weary of the broccoli quiche, and the crust is a little soggy, but it was so good, I'm not about to throw it out until I have to. 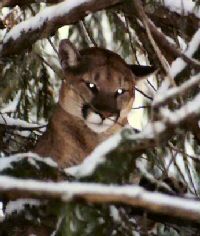 Today, I am going to meet Grant Mcomie on the river, where I had my cougar encounter. We are going to hunt him down and pet him! Yeah, right! I insist that all involved carry guns. They can play mighty hunter, while I cast my jig! That's it! Every time I fish in the wild, I'll have a small troupe of armed guards protecting me from those bad, bad kitties. I told Grant that the only way I would allow filming, is if he tells Bill how very mean to me he was, by growling when I was so afraid, that day. Andrew cracks me up, and I'm not sure what I would do without his ceaseless humor. He delivers dry humor effortlessly, and is a constant joy to have around. I listen to his talents on his bass guitar, at night. He is getting really good! David is involved in just about everything in school, and simply amazes me when it comes to music. I guess I shouldn't be surprised that he has musical talent. Music and math are his forte. He sits down at the piano, and picks songs out. Not just melodies, but both hands busy, and he has never had one lesson! I have often shouted out, "David, is that you?" Meanwhile, songs that he plays on the saxophone in his jazz band, are replicated on the keyboard, complete with a walking bass! Wait a minute! I studied 30 years to do that! Wait a minute! How do you know what a G Minor 9th is? I sigh to think that I didn't insist he take piano lessons. The kid is a musical whiz. Last night, instead of starting dinner, I began to create the chocolate cake of my dreams. Sift the flour three times? Well, alright. Five eggs? Two sticks of butter? Wow! It's sounding really good, in a really bad way! I knew I had leftovers in the fridge for dinner. Andrew knew differently. One of his many talents include near culinary genius. On arrival home from school, he gathered the leftover Portabellas, stuffed them with sliced roast beef, fontina cheese, and spinach. Yum! --But there went my roast beef for dinner! His teenage appetite was sated. He, as a child, the only 4 year old I knew who requested hollandaise on his fish. Anyhow, six o clock was growing near and my cake was occupying all of my time. Andrew entered the kitchen! I had an idea! "Andrew! Let's play that game, like on the cooking shows! I'll be the host, and you have 20 minutes to take everything you find in the fridge, and create a full course dinner for us! I'll start the timer!" Andrew agreed, with limited enthusiasm. Andrew is such a good chef! I set the timer. Ready, set? Go! I dreamed of stuffed mushrooms, wild rice, perhaps an omelet or his famous grilled potato, mushroom and tomato dish! He casually swung open the fridge and studied the options, "Alright..." There was a pregnant pause, and I really thought he was playing along as he scanned the contents. I really thought I was off the hook for dinner. "We are all having broccoli quiche." Relieved to be fishing without Cougars. 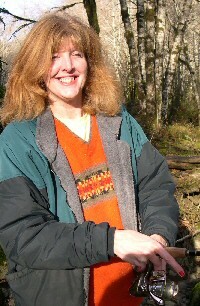 Grant McOmie took this picture of me, the day that we filmed the story about the cougar. I look happy, and not frightened. That's because the folks with me had a gun! The water was a bit low for fishing, but if was kind of neat to go back and see the sights. We found less bones of an elk calf carcass than Bill had seen before. There was elk hair spread around the site, in clumps. Kitty-kitty had been hungry. Kitty-kitty was no where to be seen on this fine, sunny day. We thought about what might have happened. Perhaps the elk was swimming in high water, and drowned, and "rescued" by the cougar? Or, was the calf hit by a log truck? Of course, we have heard that cougars do not eat anything unless they kill it. It's a mystery, I guess. The calf was not buried, as if the cougar had killed it. It was interesting to go back and explore, look for prints, etc. Not a trace did we see. Of course, the ground is matted with leaves, so it's hard to track anything. All we found was the carcass, and many clumps of elk hair. It was a bit scary to recount the whole thing, play by play, for Grant. The light was at a different angle, and everything still seems surreal. Still relieved to be fishing without cougars. I felt really crummy yesterday. Had a fever of 102, and felt for sure I was going down with the big cold/flu. I slept 2 hours in the afternoon, went to bed early, and filled myself with healthy snacks, Double X vitamins and "Wellness Formula" by Source Naturals. I can't believe it, but I feel better, today! I always struggle with whether vitamins really help people out, but I'm pretty convinced that they do. Despite how I felt, I went out fishing in the morning, yesterday. The water was on the rise, and there were quite a few dead salmon floating downriver. One hen finned closely to my feet, and stayed to visit me while I cast across the river. I spoke softly to her about her long journey, and finally, she gave up the fight, and was taken downstream, by the ever increasing current. I admire her stamina, and am dazzled by her strength and resilience. Today, I am staying at home, playing call station for the sturgeon derby that many ifishers are participating in, today. I will be doing live reports for the guys, on the board. Fun! I'll post the link, when I get the first call. I may sneak out for a couple casts with Kilch. Well, off I go. Thanks to God, that I am not sick. I simply have way too much to do, to be sick. Oh! I forgot to tell! The other week, in our meadow, we spotted a mountain quail! Clear down here, in the valley! It was a beautiful bird! It was during the last of the cold spell. We figure that is why he was down, so low. We have been blessed by the presence of our two tiny birds, of which come to visit, each year. One, a Townsend's Warbler, and the other, a ruby crowned kinglet. They come, each year, just one of each, and it's fascinating to watch them. The Townsend's Warbler is here for his third winter visit. Molly thought it a cute thing to do, to bring the tiny kinglet into the house, twice! And, twice I saved it, from cat molestation. Molly now wears a cute little red bell on her collar. I don't know that it will do much good. I think she'll just learn to hunt, all the better. I can't wait for my goldfinch, and the arrival of the hummingbirds, this spring. I'm also missing gardening. Yeah, it's settled. I'm ready for spring. Aren't you? I have bad days, also. Sometimes in triplicate. Sometimes worse than that. I thought I was sick, then I knew I was sick, then I got hilariously happy because I was all well, and then I got sick again. On top of that, yesterday, ifish's mail server got attacked. Well, at least via the form. Some trouble maker that we kicked off ifish decided to retaliate. Problem is, this fellow is also known to use guns in less than moderate situations. Do I really want to catch him and have him reprimanded? Or, do I want to just say, 'Oh! That's OK! Please feel free to flood my mail server, anytime you choose!" I spent some time trying to trace him down. I sent the results to the higher powers, and they will take it from here. God, save me from the goofballs of the internet world. I was a good girl, and finally got ahold of the low vision clinic. I was feeling quite proud of myself to be actually dialing the number. I was intent on making an appointment for both myself, and my son, Andrew. However, it turns out that he will not see us until we both have had an annual exam. "Oh! That's not hard! I just had my surgery, what was it... TWO YEARS OR MORE, AGO?" Oh. My. Gosh. I have been very lax in my eye health. Oh, yes indeed. I think, after a traumatic experience, like I believe my eye surgery to have been, the tendency, no matter what the results were, to say, "Oh! I'm Fine! Please don't contact me again!" And I didn't please to contact them again, either, obviously. Until Monday. The problem is, I have no ophthalmologist. I went from a glaucoma specialist, because of a hole in my eye, to a retina specialist, for my surgery on my eye. My retina is fine, but he was most suitable for performing a specific surgery. After my surgery, I was left seeing double, triple, and quadruple fish on my line. Yes, that is right. I try to see the good in double-double vision. More fish is a good thing, right? Anyhow, he said my eye literally fell apart in his hands, and he could not fix that. (I have repeated this phrase before, on ifish. Can you tell it grossed me out?) So, he sent me to another specialist, who had never worked on a marfan eye. He wanted to do an experimental fix on me. "Oh great! Let's experiment with Jennie's vision! NOT!" My glaucoma doctor won't take me back, because I don't have glaucoma. My retina specialist won't take me back, because he has been promoted to Dean, and is no longer seeing patients. So, who out there is my new optho? Who out there knows anything about delicate marfan tissue? I know! Dr. Maumanee at Johns Hopkins! It's just a short shuttle to and fro! See ya in two weeks! In all seriousness, I am going to call Andrew's very good and kind optho, who is a children's eye surgeon, (Dr. Goodman in Lake Grove) and she can probably recommend to me someone with marfan experience. ... and then, no more work for a while. I'm going fishing out back with Kilchis and Molly, sick or not! I feel so weak, that I need a cane, but I'm going down there and no one can stop me! ... and if you try, you better watch out! I have a cane, and I know how to use it! I gain joy from books, not only by their content, but by the weight of the book, the feel of the cover and each turn of a page. I think it's partially due to sight problems, but I am really, really into the sensations of the "feel" of books! It was with great pleasure that I snuggled under my down comforter, and picked up a copy of "Grant's Getaways: Outdoor Adventures with Oregon's Grant McOmie." The book is heavy. The cover is luxuriously soft, and each page, strong. silky, and sturdy. As I browsed through the first few gorgeous pictures, I knew I was headed for a treat of an evening adventure. Turn off the TV! I've got my entertainment for the night! The rain was falling hard on the rooftop, the wind was blowing sideways. I could see sheets of water pouring down the sliding glass door. All the weather around me vanished, though, as I was taken to places around Oregon, where the sun was shining, and the air was dry! In my mind, I made plans to travel here, and there, and over there, too! My Mother always told my Dad, "Why travel around the United States? Why travel abroad? We have yet to discover all we have here, in the Northwest!" Oh! The truth in her statements come alive as I discover with each turn of a page, all of Grant's Getaways contained in two beautifully crafted volumes of his Outdoor Adventures! I dozed off into a restful winter's nap, dreaming of summer weather, and lands, not to far from my home. Lucky for me, I haven't finished even the first book! The rain is still falling, and the books are close by my side. I know what I'll be doing, today! Oh, by the way, the police believe they have found the culprit in the mail server flooding. I have to sign a complaint today, and then see where it goes from there. The work I did in investigating, seems to have paid off! For all of you who constantly bug me about my eyes. I have a doctor's appointment on Friday! Ha ha! They caught the guy who tried to flood the ifish.net server. The police called yesterday. They figure he is the same guy that bothered ifish 4 years ago, who went by an e mail of "Oakharborkiller." Scary! He is young, and a college student. That doesn't mean he can't wreak havoc! I'm glad they were interested enough to investigate. I did provide them with more than enough information. It was time consuming, but interesting for me, all the same. I think, when I grow up, I will become a net detective. Fishing? Who could fish? The water is at a ridiculous level! Everything around me is a bog of mush. The hills, the flats! In fact, there is the first civil emergency message, issued, that I've ever seen! Click here! As I wind my way through the most historic and usual slide zones, on the way to and from Portland, I'll be sure to look up at the canyon walls and shout, "STAY! Good mountain! STAY!" There are two places that slid in the past, that actually backed up the Wilson river! How do I know that? I hear about it every time I drive to Portland with Bill! I can feel it coming as we round the corner, and I prepare to again say, "Oh really?" Ah... domestic life. I'm waiting for word back from Luhr Jensen, concerning the ifish Kwikfish. It's kind of frustrating that so much of this project is out of my hands, but as soon as I get my hands on that box, they are mine, all mine! I can decide, then, how to distribute them, fairly! I simply can not believe the response! So many people want one, that it is scary! How do I be fair, if I only have so many? Looks like I won't be getting one! I had a rotten night's sleep. I don't know if it was Molly, who snuggled with me all night, the wind, roaring around the house, or worry over my eye appointment. I kept thinking, "What if I have to have surgery again?-- What if there is something wrong? What if???" It was one of those constant battles with my Heavenly Father. Time to shower, wake the kids, feed the dogs a cookie, and make sure there is school, today, due to the high water. Yesterday, they stayed home, due to nasty conditions on the Kilchis road. There are flood pictures, here. Mostly, courtesy of Marie, at Tillamook Bait Company. She sure gets a lot of enjoyment out of her photography, and is kind enough to share it with us! Off I go. Have a great day! I wonder who will win the Okuma Rod? Pete volunteered to be the contest master, in my absence. Thanks, Pete! I like my new optho! I do! He's understanding! I have to absorb a little bit of where I'm at with this, but for now, I'll just say that I think I'm headed for surgery, soon. I think my doctor is human! I think he has compassion, and hasn't been eaten up by the "bring them in, give them drugs and bill them" disease. He actually looked intently, and directly into my eyes, and listened. He was interested! What a relief that is, when you walk into a new doctor and know that you have 40 some years of history to explain. I noted that they had not transferred my mile high records I relieved him of less history than that, but he listened to what I felt was pertinent. He was thoughtful and compassionate. I have an appointment in a month with a surgeon, who will hopefully explain to me what I need to know, to proceed. Now, I just need to follow through. I have a half trust that I will do that, and not put it off. I wonder if there is any doctor at Casey that I haven't met, now. Dr. Stout said, "You get around, don't you?" Yes, that's me. Everyone knows Jennie, or at least "Jennie's eyes." I guess it's no wonder that an eye doctor would look you in the eye, now is it? Remember Newdog? Well, his name is now, Max. The family that adopted Max was having trouble with him. He had separation anxiety, and they were very close to giving up on him. Well, they tried one more thing. They got Max a girlfriend. That picture made my heart sing! Aren't they adorable? The river is slowly absorbing into the ground, and running off to the sea. I actually have a river beach, exposed to the air, now. Fresh, with new agates uncovered, and all kinds of things to discover. Soon, Kilchis, Molly and I are going to go tromp around in the pud muddles. We'll look to see if all the salmon carcasses are gone, what new has come down river, and what will be our new sitting logs. I love our river beach. Nature is always re arranging it's furniture, so all is new. New leaning trees, new rod holders, new sitting spots, and new agates and treasures, uncovered. Bill said, "Well, there is some good to these floods. At least it cleans off the beaches from people who litter on the river, and just think how happy those annual beach clean up people will be, when they see all that stuff! It gives them something to do!" Anyway, off I go. The rain has finally let up. The river is receding, and soon... very soon... I will be able to fish, once again.